I read that vogue accused Jermey Scott as a designer that doesn’t create anything wearable. This show makes me see how that statement might be true! I watched the show with a friend. And they couldn’t see how this collection was called fashion. To a point they were right. 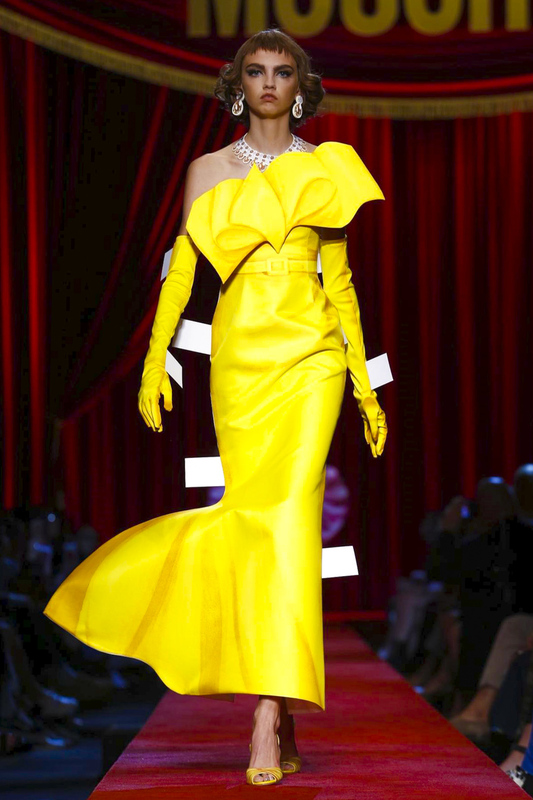 Moschino showed a collection based on the 2D paper dolls, the kind of dolls that my mum used to play with in the 70s. The outfits were filled with a 2d illusion. With white tabs, just to get the message across! I can see why it would not look like ‘Fashion’ as it seems a little unwearable. However in Scotts Defence it is a beautiful masterpiece. The detailling looked remarkable. The collection had me with mixed emotions on one side I found it irrelevant and tacky, on the other side I was in awe. I read that Scott had tuned in with the insta era and the obsession with 2D. I feel the world of technology is questionable 2D! Tacky being the printed moschino chains and belts! But in awe because of the refined drawing that gave detailling effects. Beautiful 3D looking bows. Hand placement illusions. It was filled with creativity for its theme. This is a collection that can be looked at in many ways, but its down to the consumer!